Wireless high-resolution sound reproduction from iPhone, iPod, smartphone, tablet, etc. Volume adjustment via buttons on the head. This exceptional artist has excited an audience of millions at his legendary concerts. He has now developed a brilliant sound speaker: The 66cm (26") (!) 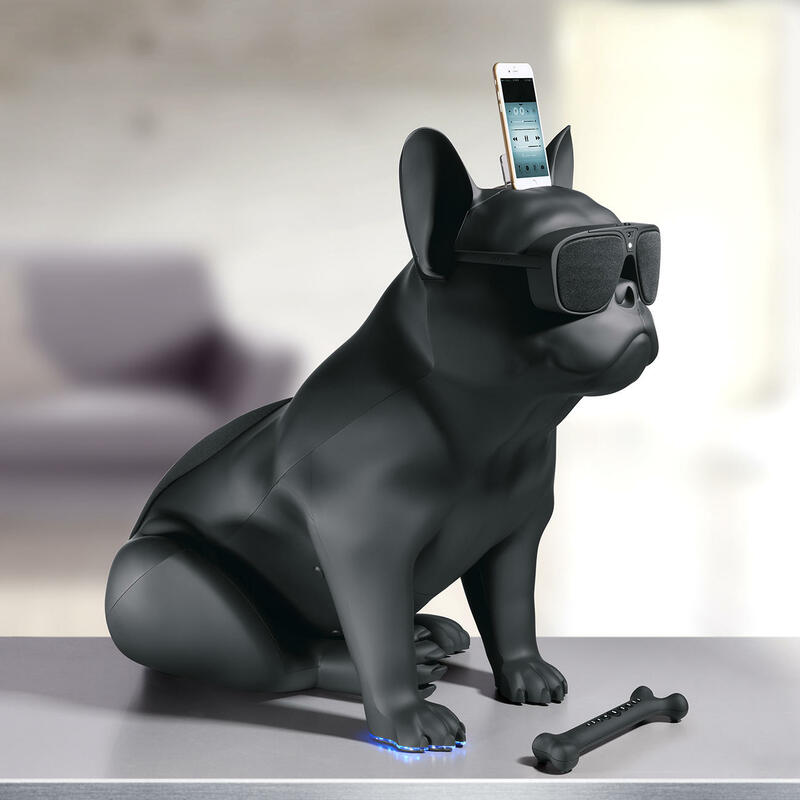 high French bulldog is a true audio miracle with high-definition sound. Plus it looks great in every room, bar or office. iPhones and iPods with Lightning Connector* can be plugged directly into the transparent dock connector (included). All other mobile devices can be connected via Bluetooth or NFC (Near Field Communication). Unlike traditional Bluetooth speakers, AeroBull supports advanced aptX® codecs. Large music files are therefore condensed and transferred with virtually no loss. As a result, you can listen to your favourite music without loss of sound quality - almost CD quality. Devices without Bluetooth (CD players, TV’s etc.) can be connected via a 3.5mm jack. Two 30W satellite speakers behind the "sunglasses" ensure clear, distortion-free high and mid-range tones (THD 1%). A 60W subwoofer at the back provides a rich bass. With its 120W (RMS) power the AeroBull easily fills even larger rooms with its incredible sound. Or with the IR remote control (2 batteries included). Made from sturdy ABS plastic, varnished glossy white or matt black. Size 44.5 x 66.2 x 64cm (17.5" x 26" x 25.5") (W x H x D). Weight 10.5kg (23 lbs). Incl. cover for the lightning interface and power supply unit with 3m (9ft8") connection cable for 100 - 240V. Free of charge: The Pro-Idee 36 month long-term guarantee. Now also in a portable compact format with rechargeable battery. For up to 10 hours of music without mains power. The same outstanding HD sound reproduction. The same rich 120W sound. The same iconic French Bulldog design. 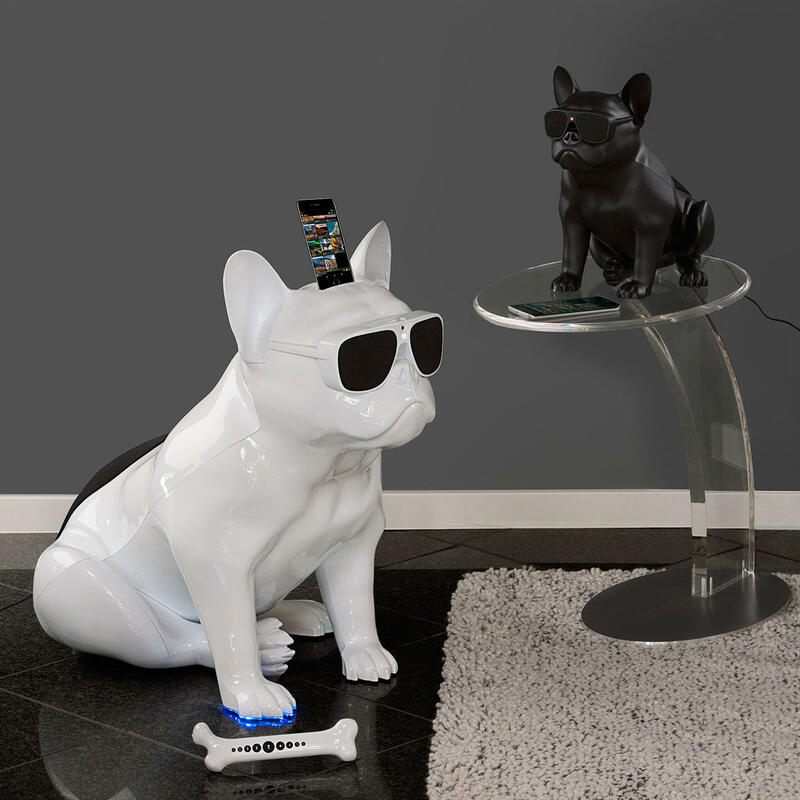 But standing at only 30.5cm (12") high, it’s about half the size of the AeroBull HD – so it’s ideal to place on a shelf, sideboard or side table. 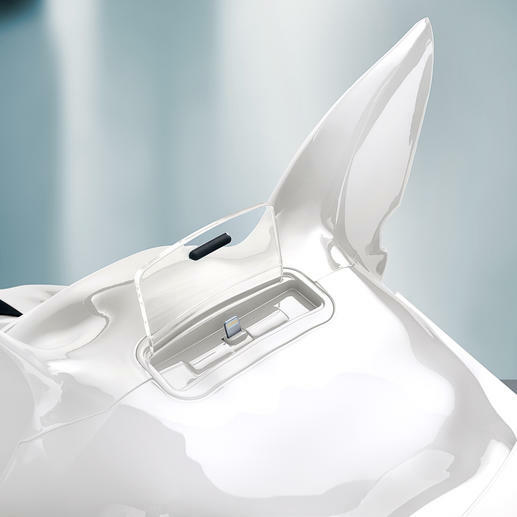 What’s more, unlike its big brother, the portable AeroBull XS1 does not need a mains socket. An integrated lithium-ion battery delivers up to 10 hours of non-stop music. Use both inside and outside on the terrace, at your garden party etc. 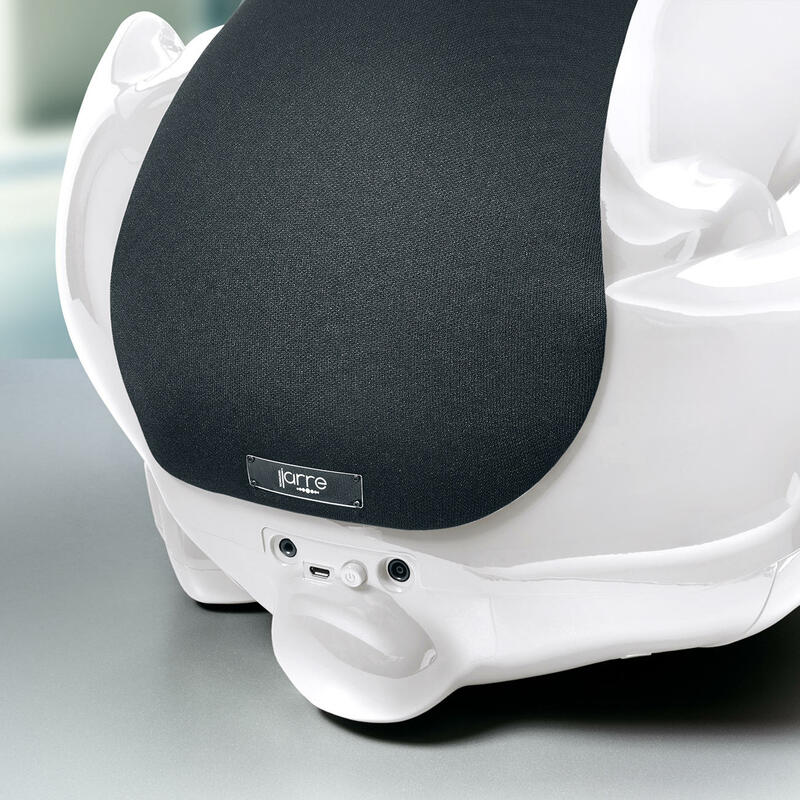 For an even more impressive sound experience, just pair a second Aerobull XS1. Connect with Bluetooth 4.1 (aptX®) to your smartphone or tablet. 3.5mm jack socket for non-bluetooth compatible audio devices (e.g., CD player, TV). Charging time approx. 3.5 hours, 150cm (4.9ft) cable for 100-240V supplied. Size 30.5 x 21 x 24.5cm (12" x 8.3" x 9.6") (H x W x D). Weight 1.8kg (4.0 lbs). In 1979 the French musician, Mr. Jean Michel Jarre (*1948), gave his first live concert at Place de la Concorde in Paris. Over 1 million people enjoyed a spectacular show featuring synthesised sounds, lighting and projection effects, earning the artist an entry in the Guinness Book of Records for the largest attendance at a concert. Almost 20 years later, the sound virtuoso eclipsed his own record, with an audience of 3.5 million at a performance in Moscow. Jarre’s famous "Oxygène" (1976) and "Equinoxe" (1978) albums are still considered to be pioneering works of electronic music. His company, Jarre Technologies®, founded in 2005, stands for premium acoustic high-tech products with an avant-garde design. The press is also enthusiastic about the AeroBull.